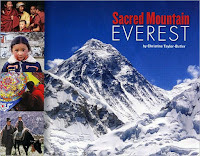 Sacred Mountain Everest by Christine Butler-Taylor. Grades 4-7. Lee & Low Books, April 2009. Copy provided by my local library. From the lives of the Sherpas who make their homes on the mountain to the brave or foolhardy people who have attempted to climb its summit, Christine Butler-Taylor paints a picture of our relationship with Mount Everest. She gives us a peak inside the towns of the Sherpas with information about their customs, schooling, and homes. She also details the various unsuccessful attempts by Westerners to climb the peak of the mountain until Edmund Hillary and his Sherpa guide Tenzing Norgay made it to the top in 1953. In addition to information about the people who have climbed this famous mountain, Butler-Taylor includes information about the area itself. She includes a spread on how the mountains were formed and the plants and animals that now live on the lower parts of the mountain. Sidebars tell readers about the homes and clothing of the Sherpas, the mystery of the Yeti, and religious ceremonies performed before each climbing attempt. Stunning, colorful photos accompany the text. Taylor-Butler includes a time line of famous Everest firsts and information about current attempts to preserve the climate and ecology of the mountain. A glossary, a list of sources, and recommendations for further study are included at the end of the book. This would be a great addition to a classroom unit on mountains and I'd pair it with Saving the Ghost of the Mountain by Sy Montgomery. Happy Nonfiction Monday! Check out the round-up at Books Together Blog.